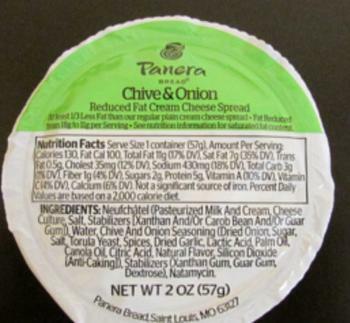 Panera Bread is recalling all 2-oz. and 8-oz. cream cheese products sold in its U.S. bakery-cafes. Reduced-Fat Wild Blueberry Cream Cheese. Consumers who purchased the recalled products should discard them immediately and contact Panera Bread customer service at 1-855-6-PANERA, Monday through Sunday, 5:00 AM – 10:00 PM. CST, or online at Panera.custhelp.com for a full refund.